Rob writes: It's been awhile since I've had a book to review but I'm extremely excited about his new book that I just received from Princeton University Press. 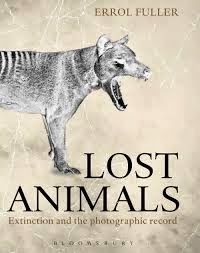 Lost Animals: Extinction and the Photographic Record by Errol Fuller take a look at some of the species that we have lost to extinction but that were photographed before they were gone forever. Fuller explores the world of extinct species through little know and seldom seen photographs that remain as our only connection with many of these species. The quality of the photographs ranges from extremely poor to quite incredible but each and every one provides you with a deep connection to the species that's been lost. The species pictured include many birds as well as a few mammals but as usual, I'm most draw to the birds, especially the species from Hawaii. The three Hawaiian species really show the range of photos that the author was able to collect for this book as well. The photos range from the Mamo that was photographed in 1892, the year in which it likely went extinct, to the Po'ouli that was photographed in 1997 by a researcher that caught it in his mist nets. As a side note, did you know that the last Po'ouli known to exist died in 2004. That means a bird has gone extinct in the United States within the last 10 years! I would highly recommend this book and hope that they photographs that the author has included will help lead people to understand how important it is to protect our endangered species This is a current problem and if we do not act to save species, his next edition of the book will be much longer and incude much more current photos.